My son turned six and loves Bakugan. No question we were having a Bakugan party. So, I decided to make the 6th Birthday Bakugan Cake myself since we couldn’t find anyone who makes them. I had also recently ventured out and starting making fondant cakes. I made my daughter’s 2nd b-day party cake and thought I would try this one. At first I was going to try to make the ball cake but quickly realized that was probably too much for a beginner. So, I settled on a double layer 9 inch round cake. I then tried to make it look as close as possible to a Bakugan card (yes, even though it was round). I made the marshmallow fondant myself and left it white. I then cut out a star shape out of lightweight cardboard to keep the sunburst effect of the white and weighted it down on top of the cake while I used Color mist spray in red and yellow all around it. Some people don’t like the spray, but if you are careful and spray with quick bursts lightly, it looks great! I then added a tiny bit of black spray on the sides. I then put a band of black fondant around the base to “ground” the cake and give it interest. I embossed the fondant with a design wheel to make it more interesting. 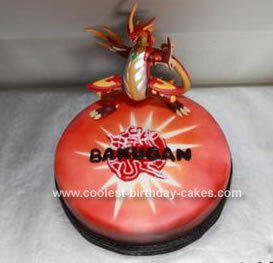 I used cut-out letters to cut the fondant and make the words “BAKUGAN” across the top. The Bakugan symbol was made with regular buttercream icing that was dyed red. It was the hardest part and not the best part of this cake! I also put a Drago toy on top to top it off! I had “HAPPY 6TH BIRTHDAY HUDSON” on the silver paper covered cake board below the cake. The kids loved the cake but I think the parents loved it even more. I was very happy with the results!